You must "belong" to the community, but it's free, and we'll approve your request in a matter of an hour or so at the most, except during the middle of the night. JOINers may be on the "panel" or "filmstrip" of ten people during the live HOA. Since I post the link to JOIN 5 minutes before the live broadcast begins, the JOINers have time to adjust their mics and speakers. If you click the unique URL and receive the message the HOA is "full", don't dispair. Literally thousands of VIEWers may watch the live feed, with less than a second delay, by going to DearMYRTLE's YouTube Channel located here: http://www.youtube.com/user/DearMYRTLE (Be sure to click on "Feed" when you get there, otherwise you are just staring at the archive of previous HOAs and uploaded videos. 9:00pm Eastern US - the live broadcast of the HOA begins when Ol' Myrt hits the "Record" button. So it's a good idea to have a second browser tab or window open for quick postings. We try our best to weave your comments and questions into the discussion, just as we did during DearMYRTLE Workshop Webinars. So have fun! Ol' Myrt here looks forward to seeing you in about 2.5 hours. What's to keep my daughters from thinking that tiny ceramic milk cow I purchased isn't one I inherited from Grandma Frances? HeirloomRegistry.com. Without it, the memories of ancestors who have owned our real family heirlooms will disappear into thin air. Worse still, without HeirloomRegistry, my descendants will most certainly confuse the real family heirlooms from things I purchased merely because they remind me of objects my ancestors once owned. I decided to test out HeirloomRegistry.com with this red and white ceramic pitcher that I truly did inherit from my maternal grandmother. It is in perfect condition, except for the tiny chip along the front base in the middle. I'm sure the Antiques Roadshow folks would say this may affect its value, but to me it is priceless. PHOTO: Taken by the author. Back: Barbara (Froman) Player daughter of Frances (Goering) Froman. Mike A. McDonnell, and his twin brother. at our home in Laurelhurst, Seattle, King, Washington. Frances' father was Charles Henry Goering was born on 10 Sep 1876 in Dallas, Marion, Iowa. He died on 5 Nov 1931 at Emporia, Lyon, Kansas. He married Estelle Mae Phillips on 23 May 1900 in Knoxville, Marion, Iowa. Estelle was born on 30 Nov 1876 in that same city. She died on 11 Sep 1921 in Olathe, Johnson, Kansas and is buried at the Graceland Cemetery, Knoxville, Marion, Iowa. From Estelle's death certificate and from information provided by Frances, the cause of death are known as rose cancer, breast and liver cancer. Names, dates and death bed statement are extracted from the Goering Family Bible, in posession of the author. PHOTO: Original in possession of the author. 1. Order "stickers" from HeirloomRegistry.com. 2. Affix the HeirloomRegistry.com sticker to an inconspicuous place on the heirloom. 3. Go to HeirloomRegistry.com and log in. 4. Click to add an heirloom. 5. Fill in the blanks to describe the provenance of the heirloom and upload the pic. See the screen shot below of my entry featuring Grandma Frances Irene (Goering) Froman McDonnel's small red and shite ceramic pitcher. Though I only uploaded 1 picture, there is space to upload multiple views of each heirloom. 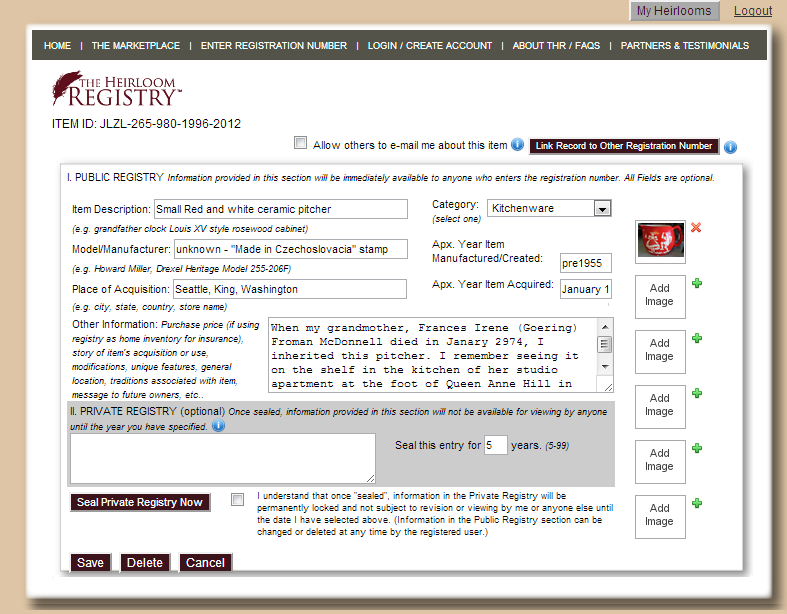 It is possible to make the registry item private, but to Ol'Myrt this defeats the purpose of HeirloomRegistry.com. "Be it a flour sifter, slide rule, quilt or grandfather clock, preserve the story of your precious heirlooms with HeirloomRegistry.com. 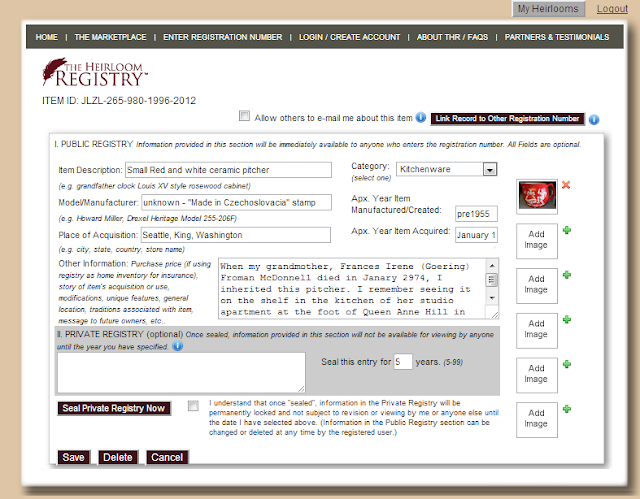 It's easy to order the registry stickers, then snap pics and upload to this innovative site. I won't always be around to tell the history of our family pieces. My 8 year old grandson can search by the registry number and read about his 2nd great grandmother's red ceramic pitcher just like that!" You've been hearing talk about this all month: DearMYRTLE's move from the GoToWebinar platform to the Google+ HOA (Hangouts on Air). N O W is the time to prepare for the switch yourself. What's different, and what's still the same for DearMYRTLE attendees? Not to worry, there is still time to practice on Wednesday night! YOU CAN DEPEND ON ENTRIES IN THE CENTRALIZED CALENDAR AT www.GeneaWebinars.com. 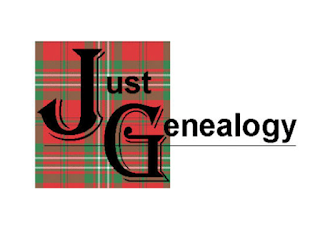 The calendar provides information about how to attend genealogy-related online meetings, classes, hangouts, seminars and webinars, where there is a visual slide share, website or software demo for attendees to view. Hosts may use a variety of platforms including Adobe Connect, AnyMeeting, Captera, Google Hangouts, GoToMeeting, GoToWebinar, Live Meeting, Skype, Web-Ex, and Wiggio, to name a few. 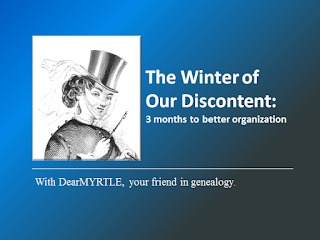 There are currently over 35 organizations with posting access to this calendar and blog, and over 200 hours of scheduled instruction for genealogists wishing to hone their research skills during the coming year. If you wish to add this calendar to your list of Google Calendars, click the "+Google" button in the lower right portion of the calendar. 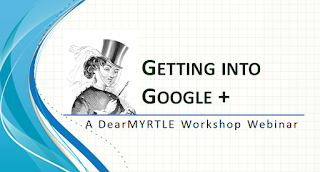 Effective March 1, 2013, DearMYRTLE will be using the Google+ Hangout on Air (HOA) for her online events such as Mondays with Myrt and the much anticipated Mastering Genealogical Proof Study Group series. Instead of pre-registering for a DearMYRTLE HOA, potential JOINers go to DearMYRTLE's Genealogy Community on Google+ about five minutes prior to the HOA for notice of the URL For the HOA. An example of this is noted in detail in Ol' Myrt's recent post Getting into tonight's DearMYRTLE Uncut HOA. JOINers and VIEWers may see the video of the 10 JOINers on the panel. Does this Ol' Myrt here have to comb her hair and apply lipstick?!! More discussion and screen sharing has been noted on DearMYRTLE HOAs than during typical GoToWebinar events. Unedited, auto-archived HOAs appear usually within 30 minutes of the end of an HOA on DearMYRTLE's YouTube Channel. 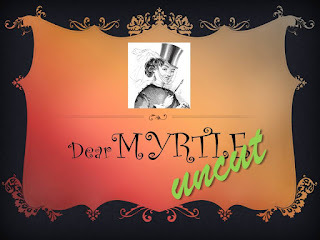 Head over to Google+ DearMYRTLE's Genealogy Community, and request to join. JOIN or VIEW the DearMYRTLE Uncut on Wednesday, Feb 27, 2013 to test out the waters. 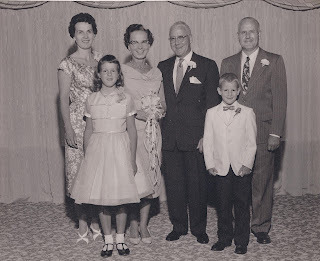 Have fun as we discuss our favorite topic - family history! NOTE from DearMYRTLE: The following was just received from our friends at the Quebec Family History Society. Please address all inquiries through their website. To celebrate our brave ancestors who came to our home and native land, the Quebec Family History Society will host Celebrating Our Canadian Roots Day on Wednesday, February 20, from 1:30 to 4:00 pm, at the QFHS Heritage Centre and Library. 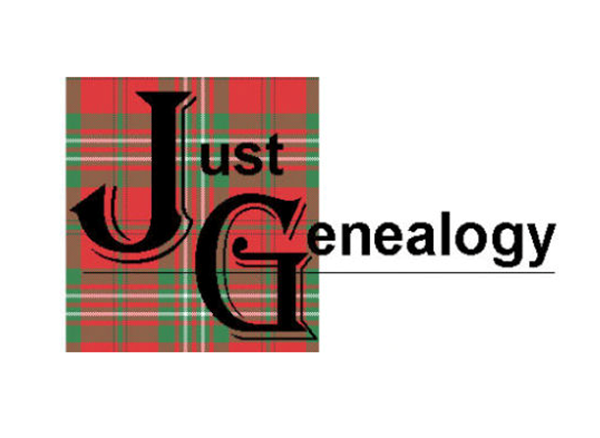 This is part of the Society's monthly "Roots Days" program, created to bring together fellow genealogists in a friendly setting. You may drop in anytime for coffee, tea, Canadian sweets, and informal conversation to talk about your ancestors who came to Canada and browse books from the QFHS Canadian collection. British, Irish, French, Italian, or from anywhere else, join us. Mondays with Myrt - on the GoToWebinar platform until 1 March 2013. Monday, 18 February 2013, Noon Eastern, 11 am Central, 10am Mountain, 9am Pacific. 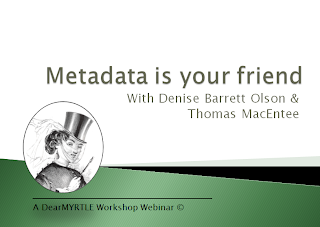 Register here if you haven't attended before: https://www1.gotomeeting.com/register/789754392 . Others will receive an automatic reminder email. The Google+ Hangout on Air titled Your Library in the Cloud with Google Books is postponed indefinitely. Our presenter Gena Philibert-Ortega is quite ill with the flu. Sending healing thoughts and prayers your way, Gena. Though Tuesday nights usually find me in Second Life at Just Genealogy, this week Ol' Myrt has been invited to present virtually for the Wisconsin State Genealogical Society. Once the hangout "panel" is full, VIEWers may watch the live video broadcast at: http://www.youtube.com/user/DearMYRTLE. What shall we discuss this week in addition to the 2013 Docu-Challenge #1: English Parish Register Marriage Entry and Evidentia? 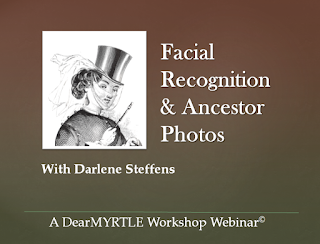 Darlene Steffans had us mesmorized by options in Google's free Picasa photo software we hadn't considered before - in particular using the "people" option to have Picasa do a bit of facial recognition detective work. Darlene explained she had received an old photo album. She and her sister-in-law had carefully removed each photo, naming each in a spreadsheet to preserve the layout and pages. Preserving these can be helpful in identification and time line considerations. As Darlene and her sister-in-law worked through the project, they were able to ask certain older family members who was in each picture. It was fascinating to see how to review potential image matches and either accept or override Picasa's suggestions. It helped to be able to click and view the full image where Picasa had picked out one individual for a match to other photo images in the file. Context is everything, isn't it? Once the internet access was u p and running again this evening, Ol' Myrt here has been quickly uploading archived webinars. This one was from yesterday's webinar where I explained why I am making the move from GoToWebinar to Google+ (G+) Hangouts on Air (HOA). I also explained the transition process I've designed during February so there is plenty of time to get familiar with G+ Hangouts On Air. I just heard from Mark Olsen of MyHeritage.com that he ran tests today and determined that there is less than a second delay between what the JOINer (panelists) are saying live in a Hangout On Air, and what the VIEWers are seeing and hearing. Thanks Mark! 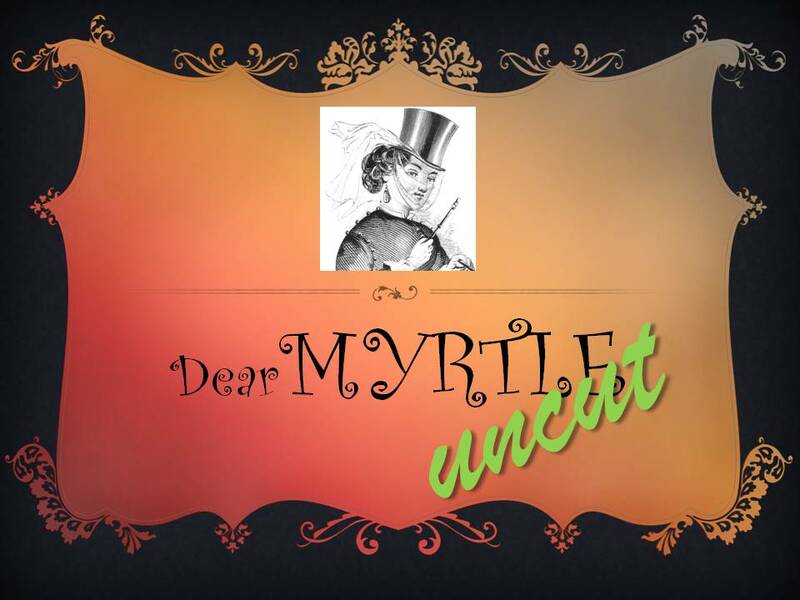 Mondays with Myrt - on the GoToWebinar platform until 1 March 2013. Others will receive an automatic reminder email. Darlene will demonstrate how to use the free Picasa software suggests matches among your photo files using facial recognition option called "People". DearMYRTLE will move from the GoToWebinar platform to Google Hangouts On Air, effective 1 March 2013. 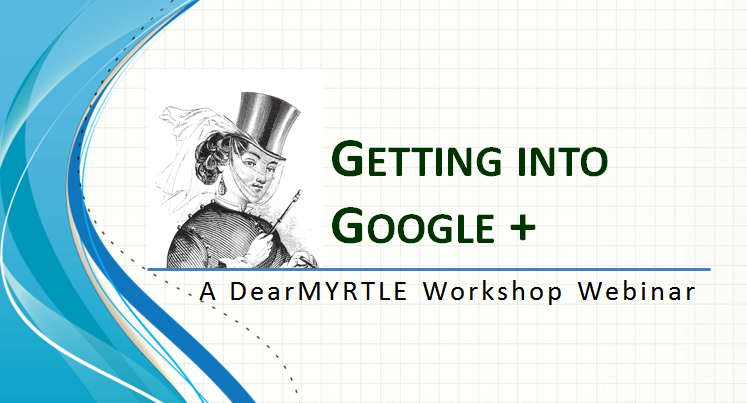 A Google+ Account is necessary for getting into Hangouts On Air and posting comments in the Google+ DearMYRTLE Genealogy Community. During the webinar we will take this topic from scratch, showing how to sign up for an account, how to add friends to your circles, how to find and join genealogy communities. Get ready to post lots of questions so we can make a smooth transition. Dress in your finest formal wear. Come stag or drag. This week we'll discuss getting accustomed to the G+ platform, and the 2013 Docu-Challenge #1: English Parish Register Marriage Entry and Evidentia. OK, are ya willing to play and learn something together on the way? Well, Ol' Myrt here has figured out how to meet the clamoring for more Evidentia Hangouts On Air through a series of "docu-challenges". Accept the challenge to transcribe and analyze a historical document and share it with others via comments to this blog post and during a Google+ Hangout On Air. Go to FamilySearch.org's Cornwall, England Parish Registers, 1538-2010. Drill down to Devonshire County, parish of Warrington Marriages 1813-1836. View the entry for William Warren and Sarah Bickle on pre-printed page 36, listed as FamilySearch's image 23. Use Evidentia software to analyze every assertion (claim) found in this source document. You will be citing the source, cataloging claims, weighing the evidence, resolving conflicting evidence, and making summary conclusions based on your analysis of each tidbit of information. Create a summary report about this marriage event. Copy/paste to your blog as a new post and report the link in comments to this blog. Those without personal blogs may also post their summary report in comments to this blog. Create a summary report about William Warren and be prepared to share it. Create a summary report about Sarah Bickle and be prepared to share it. BONUS QUESTIONS - SERIES A - for the over-achievers (read that intermediate to advanced researchers.) For the rest of us, failing to take these steps with each document we encounter in our personal research may cause us to build our own brick walls. Re: the bride Sarah Bickle: What can we infer about Sarah solely using information provided in this document? Re: the groom William Warren: What other questions about William are raised by this document? What other record groups might we search for additional information about this members of this family unit? How can we determine we're making a "reasonably exhaustive search"? RE: Evidentia: Describe the process challenges of using the software. Were there any roadblocks or concerns? If so, how did you resolve them? Be ready to share your Evidentia screens with others during the Google+ Hangout On Air by letting Myrt know via your comments to this blog. A maximum of ten panelists is available for this type of recorded event. I'll post the link to the Hangout on Air to fill up any empty seats bringing the number to ten. If you click to JOIN and receive the notice the "Hangout is full", then you may VIEW the Hangout On Air as it begins to stream live at 9pm Eastern. During the live event, post comments back on the DearMYRTLE Genealogy Community that the panelist will review constantly. DearMYRTLE Hangouts On Air are recorded and auto-archived at DearMYRTLE's YouTube Channel. Apologies to my dearest readers for having to post this. It is curious why one SLC genealogy research person persists in posting blatant self-promotion responses to my blog. My initial reaction months ago was to think we just had a nice but inexperienced new kid on the block. But my reaching out then was rudely rebuffed. Disregard for good manners and social media networking practices make me question research and analysis capabilities. I don't want to play in the GeneaSandbox with braggarts or bullies. For this reason, Ol' Myrt here shall continue to moderate blog comments to steer my DearREADERS away from such unprofessional conduct. at variance with professional standards or ethics; not befitting members of a profession." Learn more word meanings at Dictionary.com .